Does a simple move to place a jar on a high shelf seem impossible because of shoulder pain? Do you wonder whether or not you’ll able be able to sleep on your side again without waking up in agony? Has a recent injury made your shoulder all but immobile? There are many kinds of shoulder pain, ranging from the temporary discomfort of a pulled muscle to the bone-on-bone friction of arthritis. But whatever is behind your shoulder pain, you can find comfort in the fact that physical therapy offers great promise as a natural pain management modality. Contact Sports and Orthopaedic Therapy Services today to find out how this form of treatment can benefit your shoulder! Your shoulder is capable of amazing feats; however, with amazing feats also sometimes comes amazing discomfort. Your shoulder joint is called a ball-and-socket joint because the head of the humerus (upper arm bone) naturally fits into a corresponding space within the scapula (shoulder blade.) A layer of cartilage keeps the bone ends from rubbing together, and sacs called bursae keep nearby tendons from rubbing painfully against the bones. The tendons attach the bones to a set of muscles called the rotator cuff. When something goes wrong with the intricate mechanical interplay among these structures, pain is sure to result. Dislocation — When the head of the humerus pops out of its place, the shoulder is said to be dislocated. This is an enormously painful injury, and one which you may be more vulnerable to after the first incidence. Don’t assume that you have to gulp down painkillers or schedule surgery to fight shoulder pain. Physical therapy can treat many of the conditions responsible for this complaint in a safe, non-invasive manner. 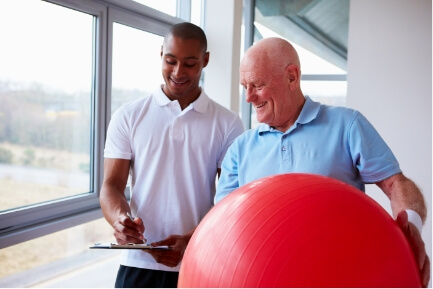 Your physical therapist can pinpoint the cause of your pain through a variety of diagnostic techniques. X-rays can reveal signs of arthritis or dislocation. Range-of-motion tests and discussion of your symptoms can tell us exactly which soft tissue may be involved in your pain. Once we know why your shoulder hurts, our physical therapist can recommend the correct mix of physical therapy methods to help manage or even completely relieve that pain. Exercises can be very helpful for easing both the pain of osteoarthritis and the stiffness of frozen shoulder. Bursitis responds well to techniques ranging from heat and ice applications to changes in your workplace ergonomics or athletic training routine. Strengthening exercises can rehabilitate injured muscles and stabilize a shoulder prone to dislocation. Life is too short to bother with shoulder pain. Contact Sports & Orthopaedic Therapy Services in Silver Spring, MD today to schedule treatment!